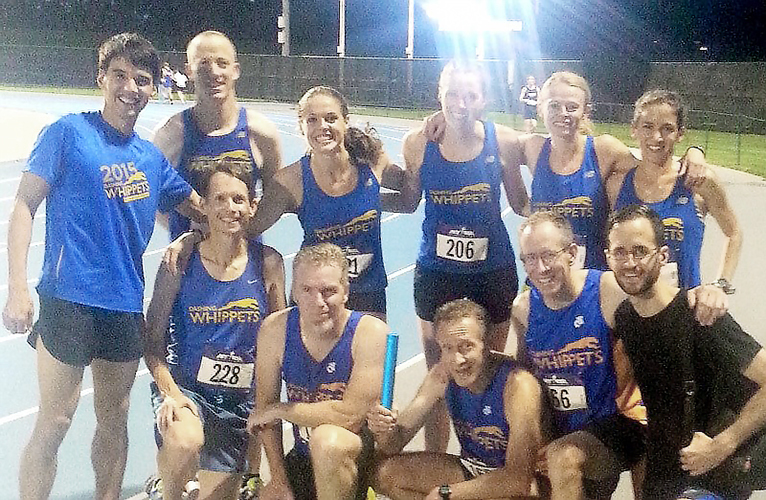 Tuesday night, a few Whippet women — mostly Marathoners! — made our way up to Randall’s Island to shake things up with the Distance Medley Relay and go after a club record. With storms in the forecast, race organizers put runners on alert mid-afternoon that the meet may be postponed or even cancelled. While we watched for updates, we made final decisions on our lineup via text: Jesse Baldwin-Phillippi would start us off in the 1200m, followed by Laura Huselton in the 800m, Cassie Wallace in the 400m, and Francesca DeLucia anchoring with the 1600m. Once we arrived at Icahn Stadium the rain was over and the threat lightning seemed to have passed. We spent the next hour alternating warming up, cheering for the other events, debating the reasoning behind the order of the distances in the medley, and strategizing. And then finally it was time to grab a baton (blue, of course, with something like Lady Nighthawks scrawled on it in sharpie) and start lining up with the other squads. Soon enough, the starting gun fired and Jesse took off. After a quick first lap, she came back to pass the 800 in 2:40, and as rough as she said it was, held on for an strong last lap to split 4:01.5 for the 1200. Despite the fact that we skipped out on practicing baton passes, the first handoff was smooth and I was able to get a quick start into the 400 and hang on to our place with a 1:10.3. Laura, a recent newcomer to the track, managed a solid field on the 800 leg, splitting 2:48 and keeping us in the mix with the women’s teams as Francesca prepared to bring us home. The final official time was 13:44.24, a new Dashing Whippets Running Team record for the DMR, and we’re already excited to get back on the track! See you in 2 weeks at the July 21 meet. At the NYRR Tuesday Night Speed Series, two records were set! 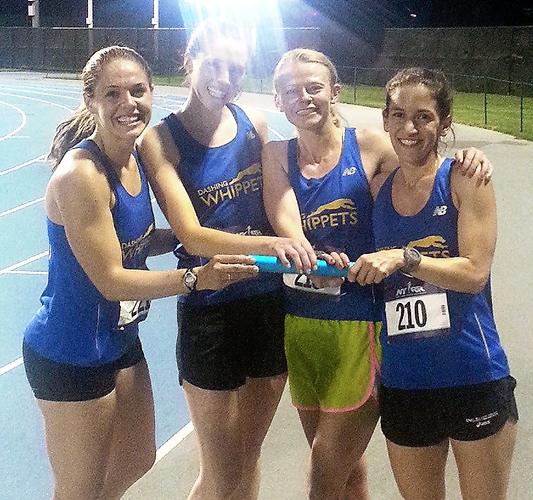 The women’s DMR team of Jesse Baldwin-Philippi, Cassie Wallace, Laura Huselton, and Francesca DeLucia ran 13:44.24, while the men’s masters team of Keith Slyman, Michael Alcamo, Scott Batten, and Jonathan Kline ran 13:13.3. Terry McGovern and Matthew Wong ran the 3200 in 10:59 and 10:54, respectively.